2016 Harley-Davidson V-Rod Muscle. Picture credits - Harley-Davidson. Submit more pictures. It took dragsters, superbikes, maybe even a little board track inspiration from deep in our racing heritage to bring together the motorcycle you see here. A liquid-cooled 60� V-twin engine ready to breathe a little fire onto the street where you live. A fat rear tire and styling details that scream American muscle. Some worry about the corrupting influence of absolute power. We say hit the gas and give it a try. 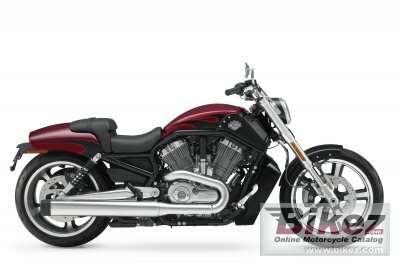 Price as new (MSRP): US$ 16449. Euro 19045. Prices depend on country, taxes, accessories, etc. Ask questions Join the 16 Harley-Davidson V-Rod Muscle discussion group or the general Harley-Davidson discussion group. Bikez has reestablished Bikez.info motorcycle web shop overview. Here we present the major online shopping possibilities for motorcycle parts, gear and accessories. This includes customizing and insurance. Search and compare products and prices. Try our 2016 Harley-Davidson V-Rod Muscle discussion forum if you have questions or comments. Information about any technical issue is always welcome.